Orano Canada Inc. (formerly AREVA Resources Canada Inc.) is licensed by the Canadian Nuclear Safety Commission (CNSC) to manage the Cluff Lake Project, located in the Athabasca Basin region of northern Saskatchewan. Orano's Cluff Lake Project was a mining and milling facility that began operation in 1981 and was shut down in 2002. Active decommissioning of the mill, tailings management area (TMA) and mining areas was completed between 2004 and 2006. Orano has a comprehensive environmental protection program to monitor radioactive and hazardous substances to determine concentrations in the environment, and to assess exposure to the public. The Independent Environmental Monitoring Program (IEMP) results for 2017 confirm that the public and the environment in the vicinity of the site are protected and that there are no expected health or environmental impacts. 3 For radon samples, two of the three radon detectors from Saskatoon Lake were destroyed by wildlife and the results are N/A. 4 For radioactive parameters where no guidelines exist, CNSC screening levels were established based on conservative assumptions using CSA Group Standard N288.1-14, Guidelines for calculating derived release limits for radioactive material in airborne and liquid effluents for normal operation of nuclear facilities and using the dose coefficients in ICRP 119. The screening level for a particular radionuclide in a particular medium (e.g., water, air, food) represents the activity concentration that would result in a dose of 0.1 mSv/a (millisieverts/year), a dose at which no health impacts are expected. 5 For hazardous parameters where no guidelines exist, CNSC screening levels, or toxicological reference values (TRV), were calculated. The TRV represents the concentration required for a representative person (adult/child) to receive a dose of 10% of Health Canada's tolerable daily intake (TDI) due to exposure to the contaminants from multiple food ingestion pathways, such as drinking water, fruits, vegetables and fish/meat. A TDI is a daily amount of a hazardous substance that has been assessed as safe for humans on a long-term basis. 6 For water samples, the results for non-radiological parameters are compared to Canadian Council of Ministers of the Environment (CCME) Canadian Water Quality Guidelines for the Protection of Aquatic Life; where no CCME guidelines exist, the Health Canada Guidelines for Canadian Drinking Water Quality and the Saskatchewan Environmental Quality Guidelines are used. 7 Regional background taken from the CNSC report, Environmental Performance of Uranium Mine or Mill Regulated Under the Nuclear Safety and Control Act: Based on Environmental Data Associated with Operating Uranium Mines and Mills (2000 – 2012) presented at the Quebec Bureau d'audiences publiques sur l'environnement in 2014. 8 Selenium concentrations in fish tissue on a dry weight (dw) basis were also compared to the USEPA 2016 Selenium Criterion for muscle of 11.3 mg/kg dw. In all cases the concentrations were below the guideline. The CNSC has implemented its IEMP to verify that the public and the environment around licensed nuclear facilities and sites are protected. It is separate from, but complementary to, the CNSC's ongoing compliance verification program. The IEMP involves taking samples from public areas around the sites, and measuring and analyzing the amount of radioactive and hazardous substances in those samples. For the uranium mines and mills samples are sent to a third-party laboratory for testing and analysis. 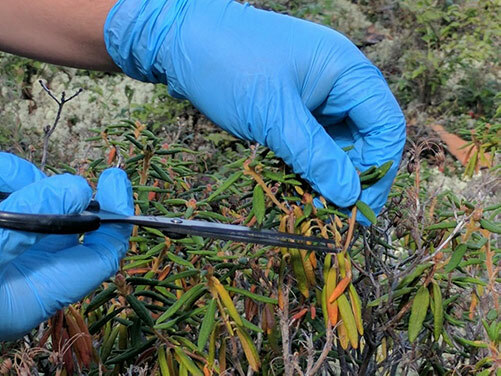 CNSC staff collecting a Labrador tea sample near the Cluff Lake Project, 2017. 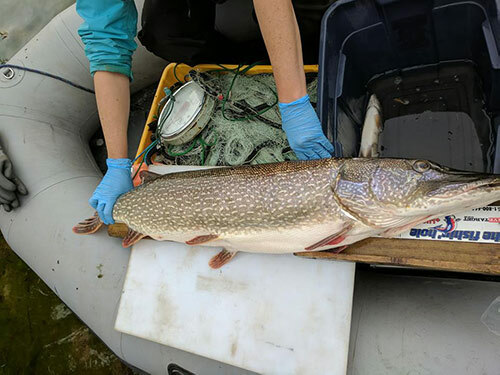 A Northern Pike sampled near the Cluff Lake Project, 2017. The 2017 IEMP sampling plan for the Cluff Lake Project focused on radioactive and hazardous substances. A site-specific sampling plan was developed based on the licensee's approved environmental monitoring program and the CNSC's regulatory experience with the site. In August 2017, radon, surface water, fish, blueberries and Labrador tea samples were collected at a reference station at Saskatoon Lake, which was not exposed to activities at the Cluff Lake site, and at two exposure stations at Sandy Lake and Cluff Lake, both located near the Cluff Lake closed mine site. For radioactive substances, CNSC staff compared monitoring results to CNSC screening levels to ensure that human health and the environment are protected. CNSC screening levels are established based on conservative assumptions about how a person is exposed and using CSA standard N288.1-14, Guidelines for calculating derived release limits for radioactive material in airborne and liquid effluents for normal operation of nuclear facilities and ICRP 119. The screening level for a particular radionuclide in a particular medium (e.g., water, air and food) represents the concentration that would result in a dose of 0.1 mSv per year. The approach used by CNSC staff to calculate a screening level is similar to the Health Canada and World Health Organization approach for drinking water guidelines, where 0.1 mSv per year is also used. The measured concentration of polonium-210 in some fish samples were slightly above the conservative screening levels. These concentrations were identified in fish caught from the exposure stations and the reference station. The reference station was not impacted by the operation of the facility and is considered background. The results show that concentrations of polonium-210 in fish are within the natural background of the region, and are not expected to result in any adverse health effects. With the exception of polonium-210 in fish, as discussed above, the measured radioactivity of other radioactive substances in water, fish, blueberries, and Labrador tea are below the CNSC screening levels. The measured radioactivity of all of the samples is within natural background values. For hazardous substances where no guidelines exist, CNSC screening levels, or toxicological reference values (TRV), were calculated. The CNSC screening level represents the concentration required for a representative person (adult/child) to receive a dose of 10% of the Health Canada's tolerable daily intake (TDI) due to exposure to the contaminants from multiple food ingestion pathways, such as drinking water, fruit, vegetables and fish/meat. A TDI is a daily amount of a hazardous substance that has been assessed as safe for humans on a long-term basis. The screening levels developed for the Cluff Lake site IEMP sampling campaign are conservative and are calculated using intake rates for a regional Indigenous diet. The selenium concentrations measured in fish samples from both the exposure and reference stations were higher than the CNSC screening level. The highest concentration of selenium in fish was analyzed at Cluff Lake in sample CU03-F02C at 0.81 mg/kg fresh weight. This represents about 45% of the TDI of 1.84 mg/kg fresh weight. The contribution from other ingestion pathways including blueberries, water and Labrador tea was negligible. Considering that only a fraction of the TDI has been reached, and taking into account the margin of safety built into the CNSC screening levels, no adverse health effects due to selenium at these levels are expected from the consumption of fish. At this location, the concentration of selenium in fish ranged from 0.50 to 0.81 mg/kg fresh weight. As a comparison, at the reference location of Saskatoon Lake, the concentration of selenium in fish ranged from 0.10 to 0.18 mg/kg fresh weight. The regional background concentration of selenium in fish ranges from 0.12 to 3.03 mg/kg fresh weight. The measured concentrations of selenium in fish at both of the exposure and reference locations were within the regional background concentration range. With the exception of selenium in fish, the concentration of other hazardous substances in fish, blueberries, and Labrador tea are below the CNSC screening levels. The concentrations of water samples analyzed are below the CCME guidelines. Also, sampling of radon in ambient air was conducted over an one-year period. The results show that radon in ambient air at the reference and exposure locations were within natural background levels. The measured concentrations of all of the samples are within natural background values. The IEMP results indicate that the public and the environment in the vicinity of the Cluff Lake Project are protected and that there is no unreasonable risk to health and the environment. These results are consistent with the results submitted by Orano, demonstrating that the licensee's environmental protection program protects the health and safety of people and the environment.